The Musser M240 4.3 octave Studio Grand Marimba has Padouk wide graduated bars set in the A2-C7 note range. 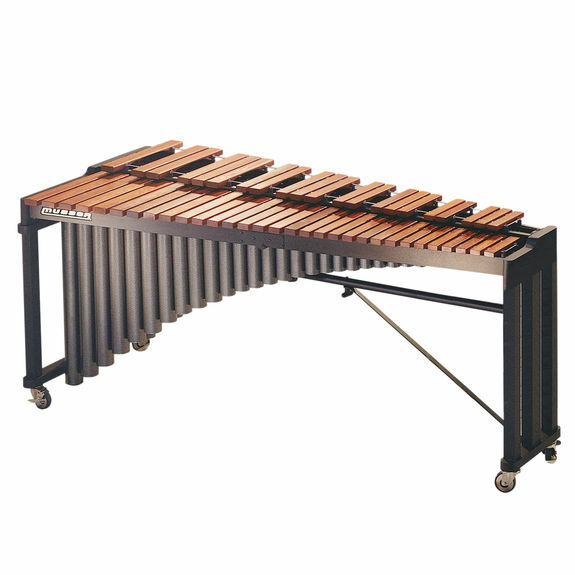 The marimba includes aluminum resonators with a durable silver vein powder coat for a full rich sound. Musser Studio Grand sets regally on a handsome wood concert frame. The M240 is a great first full size marimba for the serious student. I own one of these, and if you want a marimba that you can take apart and put in your car in 10 minutes, this is the instrument for you. I keep my five octave marimba at my house, and that is mainly stationary. This marimba, on the other hand, virtually lives in the back of my car. I take it to all places where a marimba is required, and it is still in great condition after many years. Padouk is a great sounding wood, and is also very durable ... Actually, this whole marimba is durable: from the frame to the resonators (which was a big surprise to me), and the keys, and the wheels do the job as well. Still, take care of it. Wrap the keys in a towel or a blanket when you take it apart to prevent them from scratching each other. If you play in places that require you to bring a marimba, then get this one. It's reasonably priced for what it is and is a necessary part of being a mallet percussionist.